Different adhesives are used for joining the different types of materials. The different types of peel tests available for investigating the adhesive strength are 90º, 135º, 180º and T-peel test. This paper reviews the different peel tests available as well influence of other factors for determining of peel resistance between two materials. The investigation of adhesive strength helps to select a proper adhesive material for joining of two different materials. The paper briefs the effect of peel angle, different types of peel tests such as 90º and T-peel test, temperature, moisture, thickness, the rate of change of peeling rate on peel strength. C. R. Dundeti and P. R. Punnam, “A finite element analysis of crack propagation in interface of aluminium Foil - LDPE laminate during fixed arm peel test,” Master’s degree thesis, Dept. of Mechanical Engineering, Blekinge Institute of Technology, karlskrona, 2017. S. Giannis, R.D. Adams, L.J. Clark, and M.A. Taylor, “The use of a modified peel specimen to assess the peel resistance of aircraft fuel tank sealants,” International Journal of Adhesion & Adhesives, vol. 28, pp. 158-175, September 2007. J. Jang, M. Sung, S. Han, and W.R. Yu, “Prediction of delamination of steel-polymer composites using cohesive zone model and peeling tests,” Composite Structures, vol. 160, pp. 118-127, October 2016. I. K. Mohammed, A. J. Kinloch, and M. N. Charalambides, “Modelling the peeling behavior of soft adhesives” Procedia Structural Integrity, vol. 2, pp. 326-333, June 2016. Z. L. Peng, S. H. Chen, and A.K. Soh, “Peeling behavior of a bio-inspired nano-film on a substrate,” International Journal of Solids and Structures, vol. 47, pp. 1952-1960, April 2010. S. Marzi, A.Biel, and O. Hesebeck, “3D optical displacement measurements on dynamically loaded adhesively bonded T-peel specimens,” International Journal of Adhesion & Adhesives, vol. 56, pp. 41-45, July 2014. F. N. Tuzun and M. S. T. lu, “The effect of finely-divided fillers on the adhesion strengths of epoxy-based adhesives,” Composite Structures, vol. 121, pp. 296-303, November 2014. M. Nase, M. Rennert, K. Naumenko, and V. A. Eremeyev, “Identifying traction-separation behavior of self-adhesive polymeric films from in situ digital images under T-peeling,” Journal of the Mechanics and Physics of Solids, 2 March 2016. G. Hinopoulos and W. R Broughton, “Evaluation of the T-Peel joint using finite element analysis,” The Materials Centre, National Physical Laboratory Teddington, Middlesex, Technical Report, TW11 0LW, UK. H. Hadavinia, L. Kawashita, A. J. Kinloch, D.R. Moore, and J.G. Williams, “A numerical analysis of the elastic-plastic peel test,” Engineering Fracture Mechanics, vol. 73, pp. 2324-2335, June 2006. G. Polyzois, P. Lagouvardos, S. Zinelis, and M. Frangou, “Peel testing of bond between PDMS prosthetic elastomers and cpTi: a weibull analysis approach,” International Journal of Adhesion & Adhesives, vol. 30, pp. 500-504, May 2010. W. Zeng, W. Sun, N. Bowler, and S. Laflamme, “Peel resistance of adhesive joints with elastomer–carbon black composite as surface sensing membranes,” International Journal of Adhesion & Adhesives, vol. 58, pp. 28-33, January 2015. Y. Tanimoto, H. Saeki, S. Kimoto, T. Nishiwaki, and N. Nishiyama, “Evaluation of adhesive properties of three resilient denture liners by the modified peel test method,” Acta Biomaterialia, vol. 5, pp.764-769, September 2008. A. Nick, B. Nick, and F.-J. Wortmann, “Peel testing of adhesively bonded joints of carbon fibre,” Deutsches Wollforschungsinstitut an der RWTH Aachen e. V., Veltmanplatz 8,Technical Report, 52062 Aachen. S. T. de Freitas and Jos Sinke, “Failure analysis of adhesively-bonded metal-skin-to-composite-stiffener: Effect of temperature and cyclic loading,” Composite Structures, vol. 166, pp. 27-37, January 2017. 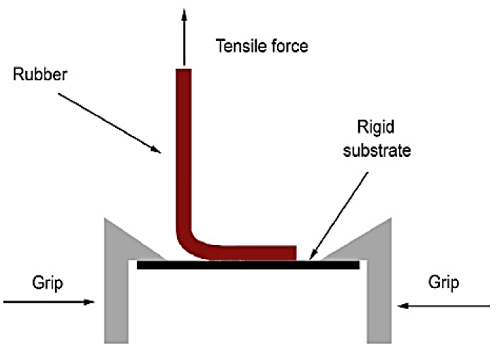 Z. Peng, C. Wang, L. Chen, and S. Chen, “Peeling behavior of a viscoelastic thin-film on a rigid substrate,” International Journal of Solids and Structures, vol. 51, pp. 4596-4603, October 2014. S. T. de Freitas and J. Sinke, “Test method to assess interface adhesion in composite bonding,” Applied Adhesion Science, vol. 3, pp. 1-13, March 2015. Y. Wang, “The effect of peeling rate and peeling angle on the peeling strength,” Master’s degree thesis, University of Akron, May 2014. M. D. Thouless and Q. D. Yang, “A parametric study of the peel test,” International Jounal of Adhesion & Adhesives, vol,28,pp.176-184, September 2007.